With a boatload of pro features and excellent performance, this box is better suited for the small office than the home. 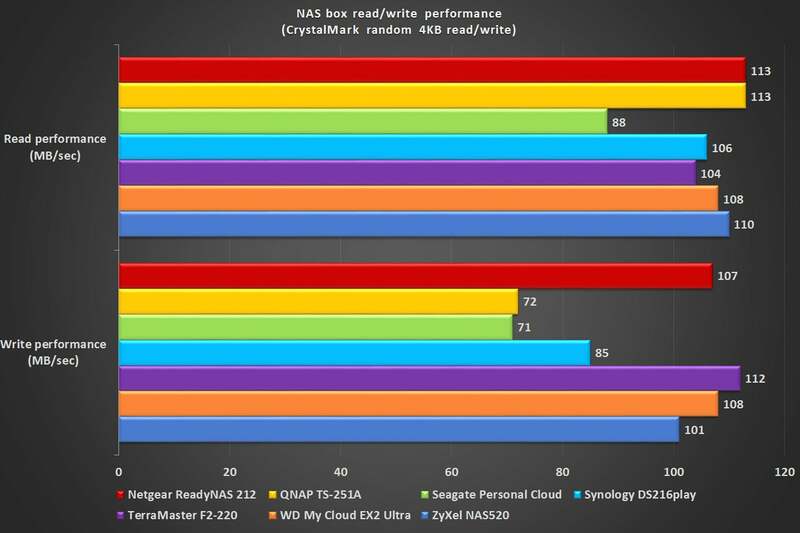 The undeniably handsome Netgear ReadyNAS 212 (available for just over $200, diskless, on Amazon) is easily one of the fastest NAS boxes we’ve ever tested. It’s also a box we’d trust in a workplace environment: It’s solidly constructed, with two gigabit ethernet ports supporting aggregation, and the B-Tree file system (BTRFS). BTRFS is sometimes referred to as the “better” file system due to its extensive backup and redundancy features. Most users will be fine with the EXT4 file system most boxes employ, but IT types love BTRFS. The ReadyNAS 212 is a two-bay enclosure with front-accessible, quick-change drive trays. Translation: You slide drives in and out of the bays from the front. Flip the left-swiveling, hinged cover back in place and you’re good to go. There’s a USB port and a backup button on the front for quickly copying files from USB mass-storage devices. The back is home to the aforementioned gigabit ethernet ports, plus two more USB 3.0 ports and an eSATA port. Our test box shipped with two Toshiba 1TB drives, but even with a pair of super-light SSDs installed, the low-profile and solid, metal construction of the ReadyNAS 212 means you’d have a hard time knocking it over. What we’re getting at is that the ReadyNAS 212 is built like a brick outhouse. Our test ReadyNAS 212, with its ARM Cortex A15 CPU and 2GB of system memory, delivered super-smooth DLNA streaming and plain file playback (launching files using the Windows browser)—when it worked. The ReadyDLNA server choked on one 10-bit HDR, 60fps, 4K UHD (2160p) HEVC file that most NAS boxes had no issue with. DLNA is supposed to be format agnostic, relying on the playback capabilities of the destination device. Thankfully, Nero MediaHome played that file just fine via DLNA. 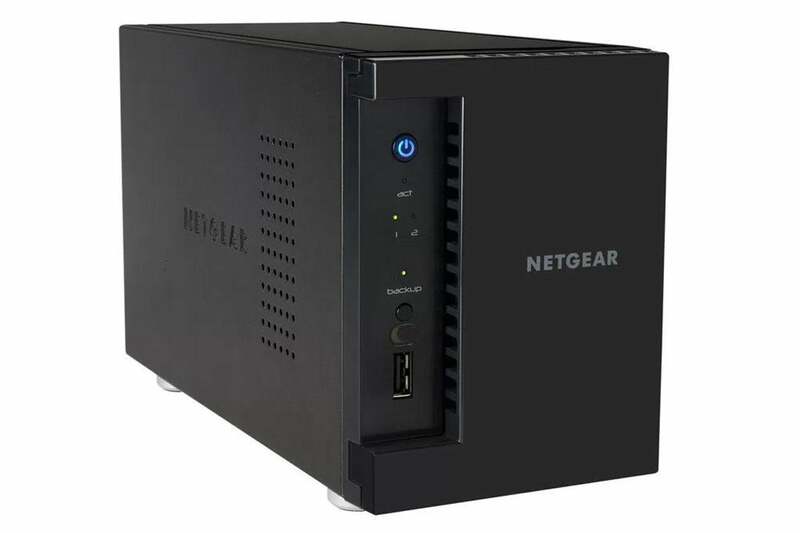 The Netgear ReadyNAS 212 is really fast, but it's priced for the business customers it's aimed at. Another minor issue was that the ReadyNAS 212’s iTunes server enumerated Opus and Windows lossless files that aren’t actually playable by iTunes. The product brief talked about ReadyDLNA clients for iOS and Android, but apparently those never materialized. The ReadyCloud portal access apps are available, but they don’t play files, they just launch them in existing apps. Netgear’s app selection has grown significantly since our last look at a ReadyNAS, and now matches up fairly well with Synology’s and QNAP’s. The selection is heavy on business, backup, and web publishing, but there’s a decent number of multimedia apps, including the aforementioned ReadyDLNA and Nero Media Home servers. There’s also a surveillance feature that includes a license to use one camera. Some of the more esoteric apps require IT-type knowledge to install, but the streaming and backup are already in place. The ReadyNAS browser interface isn’t windowed, but it’s clean and very efficient. One thing I particularly like is the backup tab where you can define local-to-remote, or remote-to-local backups via FTP and rsync and other protocols. I’ve become a big fan of FTP recently. Alas, for some odd reason, you aren’t allowed to browse remote FTP folder structures (so you can see where you want to put your files); you must manually copy and enter the path. Quaint. 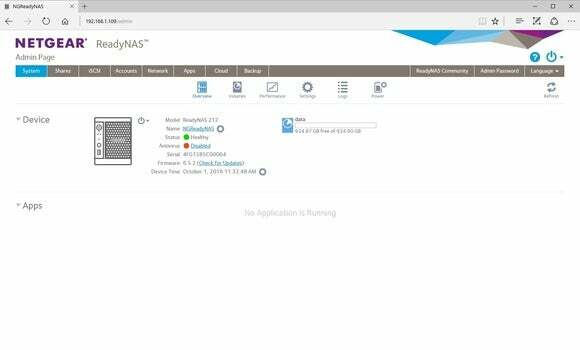 The ReadyNAS 212 is fast, rugged, ticks all the corporate boxes, and is easy to set up and administer. The multimedia streaming is as smooth as butter, but there were the odd operational glitches. For the small office or workgroup? Great stuff. Home use? Perhaps with some software refinements. This box ticks all the corporate boxes; it's also fast and it uses the state-of-the-art BTR file system. Only minor multimedia glitches and a couple of oversights kept it from a four-star rating.